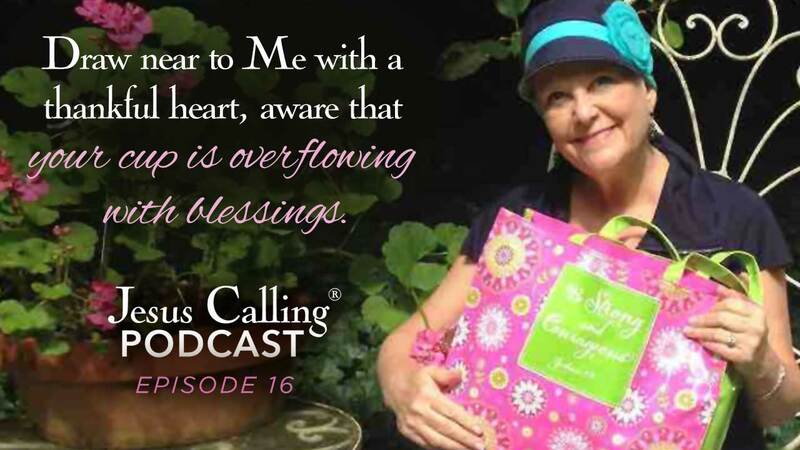 Kristianne Stewart is a self-proclaimed “missionary to the cancer world.” She is the founder of Compassion That Compels, an organization that brings tangible items of encouragement to women currently battling cancer through the gift of “Compassion Bags” and spiritual support through the words of Jesus Calling. Kristianne Stewart: I knew that without God there was an empty hole in my life. As I fast-forward through the years, I can say that there are moments in my life that are watershed moment for me, and what led me to Compassion That Compels. So Compassion That Compels was a ministry that was birthed from my own personal pain. I wanted it to be a ministry that would reach out to the walking wounded, to the women that were hurt, had either suffered hurts through the church and their own personal life, or as a result of their own choices and decisions. Narrator: Welcome to the Experience Jesus Calling Podcast. Today we meet Kristianne Stewart, the founder of Compassion That Compels. Kristianne’s burden for women dealing with cancer began with the diagnoses of each of her sisters-in-law, and then later her own sister. 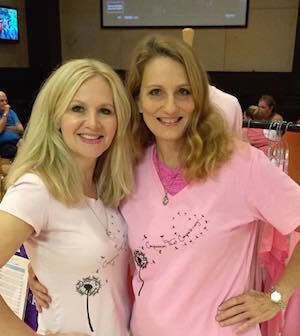 As she walked through their individual battles with the disease, she began to see the need for tangible items of hope and encouragement for women everywhere as they face their own cancer diagnoses. Kristianne: My name is Kristianne Stewart, and I’m the founder of Compassion That Compels. 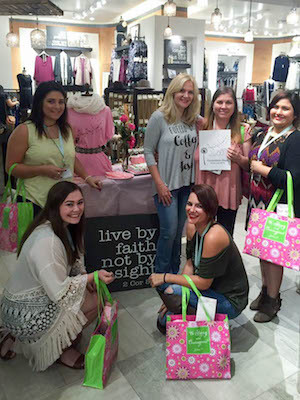 We’re a ministry and a nonprofit that provides hope to women battling cancer, one compassion bag at a time. Kristianne: There are days that you remember forever, there are moments and there are times. And I remember very clearly sitting on a little pink couch in my kids’ playroom, and feeling the wind kind of blowing through the open window, and struggling to hear my sister-in-law on the other end of the call. All she could get out was that she was at the doctor’s office, and that she had cancer. In a fit of tears, she handed the phone over to her doctor, who shared with me that she was struggling, and had been diagnosed with a very, very rare form of skin cancer, the most aggressive. That there was no known treatment, he’d never seen a case of it ever. Kristianne: We spent a lot of time in waiting rooms sitting alongside someone who is in the fight of their life, and I just started to watch people. Everybody had a story. But I started to connect with them on a new level, and it was a compassion that compelled me. Kristianne: After Sonja passed, I found myself crying for no apparent reason. I would get in my car, I’d go someplace, I’d look up, 15 minutes had passed, I was in the parking lot with tears streaming down my cheeks. Kristianne: Then one day, something changed. I can’t say that it was God talking to me, but it was. It was an audible voice. He said simply this, He said to be quiet and to listen. So I did something that I rarely, rarely did at that time. I stopped crying, I stopped talking, and I listened. When I listened, I heard them; I heard the cries of the hurting. When I opened myself up to it, I began to see people in a new light. That’s where Compassion That Compels was birthed. It was a ministry for the walking wounded. The compassion bags were the smallest part of the ministry. That’s where Compassion That Compels was birthed. It was a ministry for the walking wounded. Kristianne: 18 months later after Sonja’s diagnosis, my other sister-in-law, Pam, was diagnosed with breast cancer. Kristianne: Most people wouldn’t know Pam Stewart, but you would know her if you had close contact with her. If you were homeless and you lived anywhere near her, she took you in. She fed just about half the town that she lived in, and everybody knew her for her kindness. So, Pam opted for clinical trials when she no longer responded to chemotherapy. She would sing hymns each time. She told me after one of the treatments that failed, she said, “Well, Kristianne, now we know it didn’t work for me, but it may work for one of those young moms with small children. So it was worth it wasn’t it?” That was the kind of person that Pam was. Her legacy of faith and joy, oh, it just resounds through Compassion That Compels. Kristianne: In the spring of 2013, I decided that I would launch this Bible study that I had, that I had written, and I went on Facebook for the first time ever, and within 3 days we had a viral Facebook post. No, it wasn’t about the Bible study, it was everything about the compassion bags. So 14,000 people saw that post. Kristianne: I was like, “Wow, the power of social media, this is incredible.” But it wasn’t just that. I think that God had ordained the time, and he had ordained me for my calling. So I had a decision to make. 23 compassion bag requests around the nation. The website wasn’t up, it wasn’t even geared towards it. So I went to my husband who is the great balance in my life, and I told him, “I really feel like God is calling me to respond to these women, and I’m really hoping that once I respond to them, that then I can move on to the Bible study.” Because right? That’s what he called me to do. Kristianne: And God poured his grace upon me in such an exponential way. So the 23 women, they received their compassion bags, and so did the 300 by the end of the first year, and the 1100 by the end of the 2nd year, and the 2000 by the end of the 3rd year, and we’re just about to reach our 2506th compassion bag recipient since that viral post on July 5th, 2013. Kristianne: Can I tell you about the bags? Because they’re my heart. Kristianne: The Be Strong tote. So the tote, itself, if we didn’t have a tote, we wouldn’t have a bag. Anyone who has walked through cancer, or if you’ve ever had a surgery. Or you’ve walked alongside a cancer overcomer, at one time you’ve stuffed their clothes into an oversized plastic bag that closely resembles a reusable cold bag. So our bags are for women battling all types of cancer. But pink is one of my favorite colors. So the Be Strong tote has a collection of colors from myself; Sonja’s favorite color, she looked beautiful in green; from Pam and Vikki, my sister. Kristianne: So there’s a journal in The Compassion bags. There’s a notebook and that’s for the caregiver or the advocate. Kristianne: So we put organic decaf tea. It’s Bible verse tea so it has a verse on every single little tab that’s on the tea. We also have our BPA-free mug that has scripture on it as well. It’s good for hot and cold liquids. So we say because the hospital coffee at 6pm is often thick as glue and you have a mug for when coffee glue can’t be found. Kristianne: We have a custom pen. You can never, ever find a pen in a treatment center hospital when you need it. Never, never. Kristianne: Then there’s scripture candy soft mints because during treatment, your mouth is dry or suddenly becomes dry when you see a doctor or nurse approaching with your chart in hand. Kristianne: There’s a custom blanket and it has our dandelion logo on it. Kristianne: On that blanket, that’s a favorite in the bags as well. It’s to cover you with His love. Besides, if you’re not freezing, the person that brought you or that’s sitting next to you probably is. It’s bitterly cold in a treatment center. Kristianne: There’s a Chick-fil-A gift card just to get away from the hospital. There were times I just needed to get out. There’s a sadness in a treatment center and you just never knew what to expect. So sometimes getting away gave you fresh perspective. Kristianne: There’s the Jesus Calling Devotional. I can’t tell you all enough about what a Jesus Calling Devotional means to a woman who’s facing a cancer diagnosis or her family members. Kristianne: In a cancer diagnosis and a cancer battle, you suddenly become invisible because cancer hijacks your life. It hijacks your identity. No longer are you known as mother, daughter, wife, sister, friend. You’re known as a medical record number, a diagnosis code. But God sees you. He sees your pain and He knows you and He cares about you and He loves you. So, every page of this devotional, I hear it again and again. It meets me right where I am that day. 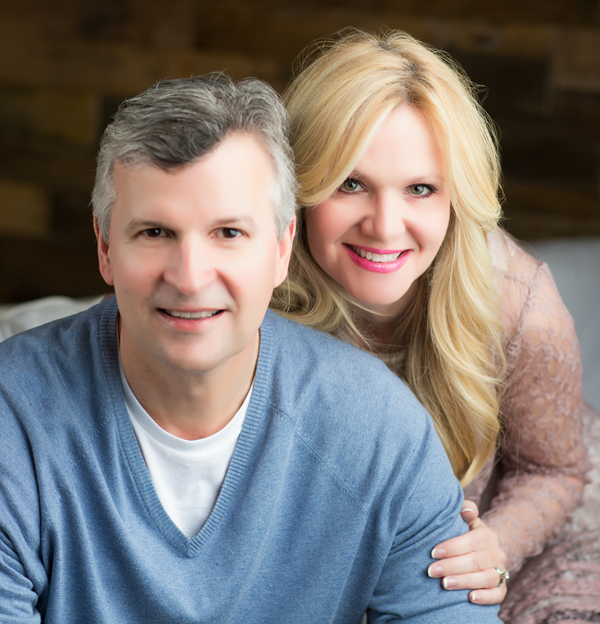 Kristianne: Before I open the devotional, I’ll ask them, “Tell me about your perfect morning.” Beautiful Belinda, she shared with me kind of quietly. She shared and said, “My perfect morning is because of cancer. Because before cancer, I wasn’t able to be at home in the morning to make breakfast for my children, to be with them, to see them off at the school bus, to make sure that I ran a comb through my son’s hair before he walked out the door. I never had the ability to do that. I was always working. But now, I’m home and it’s a privilege for me to be able to do it.” What I didn’t know about Belinda is that that day with the Jesus Calling, we planted a seed. 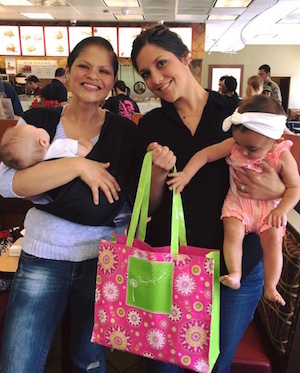 Her bag had been sponsored by a clothing store called Altar’d State and through their program called Mission Monday, we were able to provide bags through the stores to the Cancer Treatment Centers located within that store’s community. Kristianne: Belinda and I kept in touch. She sent me a thank-you note. Then I discovered, as I asked her to share her story on our blog, that Belinda had been an atheist. She’d had never owned a Bible in her life. She was 42 years old. She got the Jesus Calling and she slowly began to give her life to Christ. She gave her life to Christ in one of the roughest seasons of her life as her cancer spread and became metastatic as it traveled to her brain. She asked God not to spare her life but to give her enough time. Two months ago, Belinda and her entire family were water baptized. She goes to church. She has a relationship with the Lord and she knows that should her miracle healing happen in heaven, that she’s experienced the greatest miracle here on Earth. 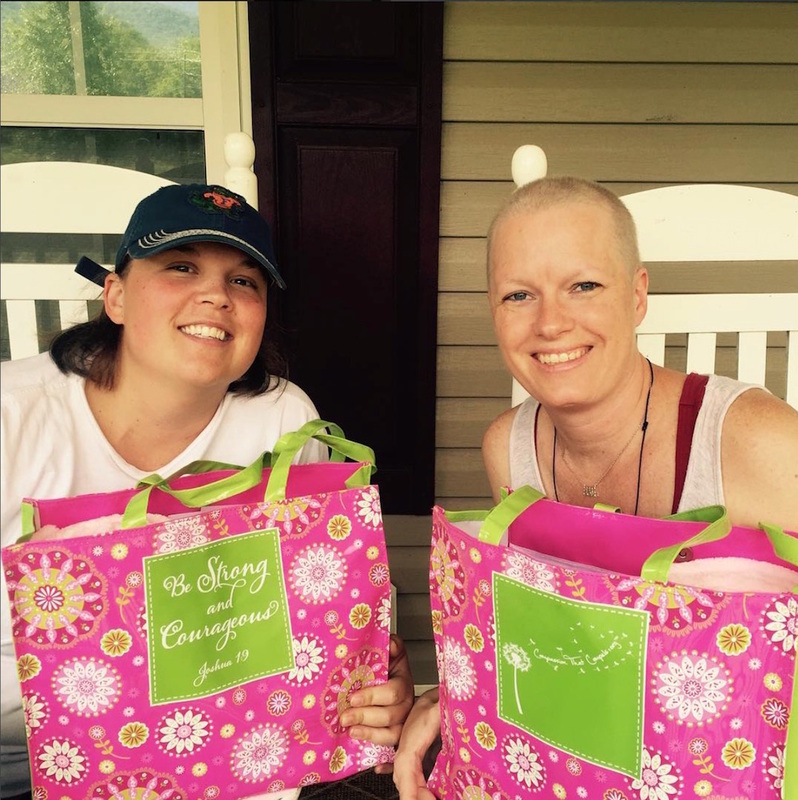 Kristianne: The bags go to all women who are currently battling any type of cancer. It does not matter. It’s not always the believer next door, it’s not always just for you, it’s for the ones that need to hear the truth of God’s Word. And we all need it. Narrator: Kristianne knows personally what it’s like to receive a life-changing diagnosis. As part of her ministry, Kristianne offers a free 52-week discussion guide to help those who are dealing with a devastating diagnoses. Kristianne wrote the guide in the midst of facing her own health crisis. 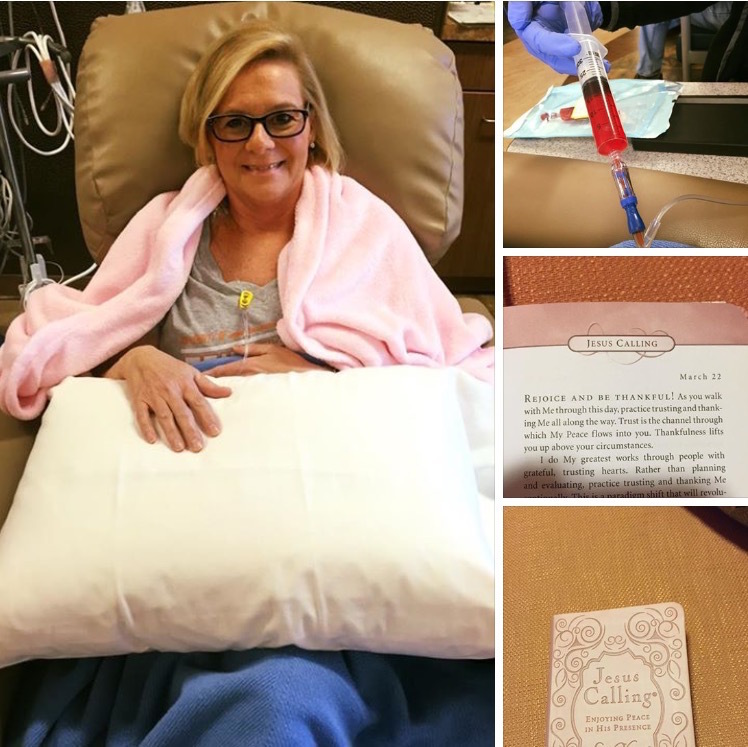 The study utilizes relevant passages from Jesus Calling and scripture to help those facing the challenges of cancer find their strength in the Lord. Once again, Kristianne. Kristianne: I had a life-changing diagnosis. I was experiencing it and I was writing it from my own perspective and not just as a founder of Compassion That Compels. Kristianne: I was facing a 6-hour surgical procedure and it was the last of my own reconstructive surgeries. So I needed to get that behind me and I knew that I had another surgery after that, but I somehow felt that was the perfect time for me to be able to share and write. So, in between my surgeries while I was having my hospital stays, I wrote it. I wrote it based on the very first thing, the very first week, week one, is you are intuitively designed by God to overcome, because that’s what I share with every person that’s facing a life-changing diagnosis. Kristianne: In fact, you are an overcomer not simply from what you’ve survived but from what you’ve overcome. That means the second after you were diagnosed you became an overcomer. Kristianne: I wanted to write it not just for a person that was facing the diagnosis and walking through it, but I also wanted it to be for the family and the caregivers, because no one fights this alone. Kristianne: It was a labor of love and an honor for me to write this discussion guide and I’m so excited that you’re able to download it for free at JesusCalling.com/groups. It’s an excellent guide, not just for you facing a life-changing diagnosis, but maybe for your family members and for your friends, for your community. Kristianne: We need your help. It’s never been about a bag but about a beautiful and brave woman in the battle of her life. So once you look past the bag and you see the heart of Compassion That Compels, we rely solely on donations. Kristianne: There are so many ways to help but the most important way right now to be able to reach the women waiting for Compassion bags is to donate online. The bags are valued at a $120 each. You can sponsor bag anonymously for someone. You can send a bag to someone that you know who’s battling. Include a personal message, a prayer of encouragement or words of hope, that will all be shared with them. You can donate towards an item in the bag, whether it’s the Jesus Calling, the blanket, the journal, and then share a message of hope and encouragement as well. That’s called a Blessing Card and that’s placed in each of the items and then placed in the bag itself. Kristianne: When I realized that I could dream big, knowing that I could just dream big, but there’s a gift in that Global Leadership Summit. We give out two scholarships to women who are either battling cancer or have battled cancer. We’ve had women start their own cancer care support groups after attending the summit. Then the other two are given to young leaders. Kristianne: I like to speak into them so we have a younger generation to be able to go to the Global Leadership Summit. Kristianne: We’re missionaries to the cancer world. 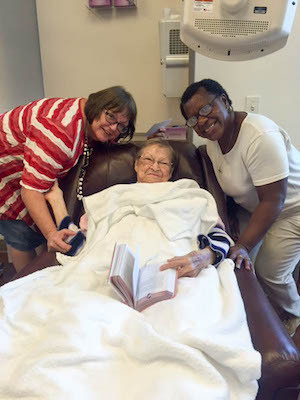 There is no better place to show the love of Christ in a cancer diagnosis. Narrator: To find out more about how to support Compassion that Compels, visit them at their website at Compassionthatcompels.org/donate. Narrator: Next time on the Experience Jesus Calling podcast, we present the second in our series on The Women of The Next Door. Tammy Arnold grew up in a world of pain. Abandoned by her family at an early age, Tammy sought to escape her trauma through drugs and alcohol. This spiral took her down a dark road for many years, and it wasn’t until she prayed to God for help that she began to see the light that would eventually lead her to The Next Door. Tammy: I was sitting there looking at these drugs in front of me and I just begged God. I said, “God please either save me or let me die,” and He choose to save me. Tammy: The Next Door changed my life. There was something in me that told me that I had, that I was meant for something better than what I had had my whole life. Thanks to my belief in God that my grandmother instilled in me all those years ago that I never ever, ever gave up on, even though I may not have lived like it. I knew He was there. I always, always knew He was there and I think somehow I always knew He was gonna save me. Because He let me know in ways that He thought I was worthy even if no one else did. Narrator: Our featured passage for today’s show comes from the July 5th entry of the Jesus Calling audiobook. Draw near to Me with a thankful heart, aware that your cup is overflowing with blessings. Gratitude enables you to perceive Me more clearly and to rejoice in our Love-relationship. Nothing can separate you from My loving Presence! That is the basis of your security. Whenever you start to feel anxious, remind yourself that your security rests in Me alone, and I am totally trustworthy. You will never be in control of your life circumstances, but you can relax and trust in My control. Instead of striving for a predictable, safe lifestyle, seek to know Me in greater depth and breadth. I long to make your life a glorious adventure, but you must stop clinging to old ways. I am always doing something new within My beloved ones. Be on the lookout for all that I have prepared for you. 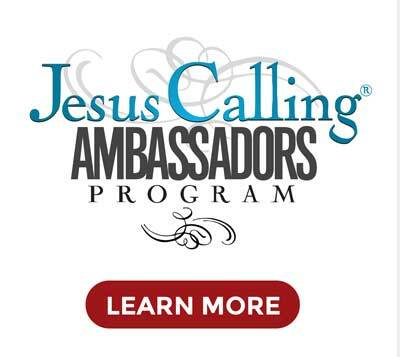 Narrator: Hear more great stories about the impact Jesus Calling is having all over the world. 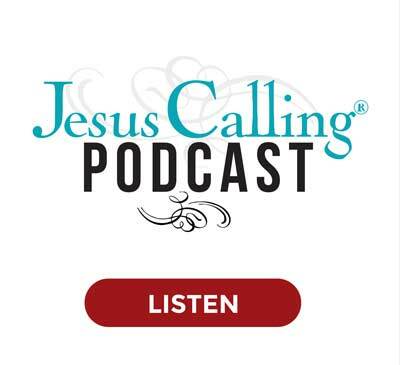 Be sure to subscribe to the Jesus Calling Podcast on iTunes. We value your reviews and comments so we can reach even more people with the message of Jesus Calling. And if you have your own story to share, we’d love to hear from you. Visit JesusCalling.com to share your story today. devotional in every bag and is always a favorite. All glory to our heavenly Father. I have been looking for something for my daughter and I to volunteer with. My mom was an inspiration to all of us with her fight and her faith. We are located in the Conroe/Humble Texas area. Sweetheart, you are an inspiration to everyone!!! God Bless You!!!! You are doing God’s work! How can I start doing this to Mother’s of Children of Cancer?? They are always so busy with their children with the cancer, their families and most are divorce and dealing with all of it. I would love to do this for them. They are the ones that don’t worry about themselves, depression and anxiety hits them and deal with it all. Could you help me by giving me some ideas on how to start this for them? I’m on Facebook, Judy Gorges from Dale Wisconsin you can private message me and we could get each oother’s phoney numbers. I pray you will heal. I will put you on my prayer list!!!! I hope to hear from you!!! I would love to be your friend through Jesus Christ our Loving Lord!!!! God bless Kristianne and Compassion that Compels. I received my compassion bag a year ago and I cannot express in words how much my bag brought me comfort and hope. Enjoyed everyone’s comment. It’s very uplifting knowing I’m not alone, and others have the same feelings! I am currently fighting lymphoma. I’m getting radiation for the third time for this.